irrigation method – mainly drip or surface irrigation. An overview and description of different configurations of the individual components is provided in the GET INFORMED module. Technically, any irrigation method can be combined with a solar water pump. However, it becomes a matter of cost. Pressure and high discharge require more energy and therefore higher costs. Drip irrigation, working at comparably low operating pressures and water efficient, suits solar pumping systems best. Yet, it requires that the producer learns new irrigation management skills. The suitability of a particular system configuration for a given farm depends on the water availability, the farm’s specific water requirements, its agricultural production and the producer’s skills and budget. The human and financial resources required for maintenance should already be considered in the design of the system. As a rule, higher investments in good quality equipment outweigh the time and effort put into maintaining and repairing poor quality equipment. Figure 1 shows an SPIS configuration where one saves on the costs for the reservoir but spends on the tracking systems. The tracking system enables a relatively stable pump dis-charge which is important, because there is no reservoir to buffer the amount of water going to the field. The water can further be controlled by the valves and by splitting up of the drip irrigation system in sections. 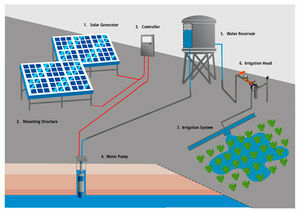 Figure 2 shows another, more common, configuration where water is pumped from the ground and stored in an elevated reservoir. The water goes through the irrigation head, which can be equipped with volumetric valves, and/or a fertigation system. Nevertheless the producer is forced to divide the field into small sections to allow a relatively controlled distribution of water across the field. This SPIS configuration requires relatively little maintenance as the panels and the pump are fixed. Results of comparative financial analysis. PV water pumping works best with low pressure drip irrigation systems. The direct connection of the solar pump to the irrigation system leads to a dynamic and varying hydraulic load, which makes planning more complex. Varying hydraulic loads can be mitigated by (a) using automatic valves, (b) adapting irrigation field size (c) and solar tracking. 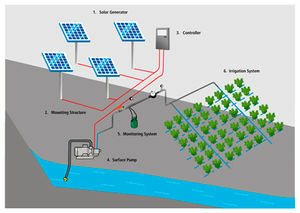 Combining PV-based water pumping with traditional surface irrigation methods tends to be non-viable in financial terms. This page was last modified on 3 April 2018, at 13:19.